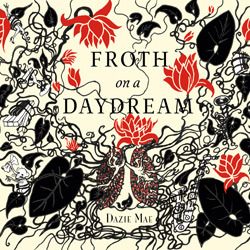 freely inspired by Boris Vian's "L'Ecume des jours"
Can’t Be Serious Records is thrilled to announce the release of Dazie Mae's 4th LP: "Froth on a Daydream" (08/12/2015). Celebrated over the past 60 years as one of the most beloved piece of French literature, "L’Ecume des jours" is a surrealistic tale that inspired Dazie Mae in crafting 20 songs & instrumental pieces blending together blues, jazz & cabaret (and even a drop of bossa-nova and country music !). In 2012 and 2013, the song "Sad, Depressed & Lonely" from album "Songs Matured in Oak" is one of French national radio FIP's selections. "Time with my lover", from the same album, appears in director Malik Barnhardt's movie "C'est la vie" (2014). Their 4th LP, "Froth on a daydream" (2015), is freely inspired by Boris Vian's cult novel "L'Ecume des jours". Words and music by Serge Dejazz/Mathias Daval, except track #15 by Tom La Meche. All rights reserved. Recorded and mixed at Bop City Studio (April-May 2015). (c) 2015, Can't Be Serious Records | "L'Ecume des jours" (c) Cohérie Boris Vian. With the kind approval of Editions Fayard.